Each day for CHD Awareness Week I'll be posting about the 7 most important things I've learned as a heart mom. From practical to spiritual, the past 2 years have been a new experience for me and for us as a family. My prayer is for these insights to help educate and encourage my fellow heart moms and others who follow our journeys. And don't forget to check out the end of this post for a special heart giveaway! I’ve learned why awareness and advocacy are SO important. The question I know I find myself asking is WHY? Why, when 1 in every 100 children in America is born with this defect (and the numbers are greater than this in some areas around the world), is there not MORE being done? WHY only fraction's of PENNIES are being spent....And my final question is always, how did I not KNOW about this? When Liam was born, I never gave a second thought to heart defects or birth defects in general for that matter. I guess I assumed they weren't that common. I never ONCE saw any information on CHD's, not in my OB office, nor in our pediatrician office. So in my lessons learned list, Awareness and Advocacy are definitely one of them. I have definitely learned that not only can CHD’s be life threatening, they are also very common. Our child's hope and future depend greatly on the advance of medical technology and also the role of government in our healthcare system in order to provide adequate funding to make the research possible. I have also learned some practical ways we can help. First of all there is AWARENESS, which is the goal of this one week in February. To educate, get the word out, and let CHD become a common term. The more people who know about it, the better chance they have at saving a life. They could even end up saving their own child's life someday. So while the Facebook messages and blog posts might be overwhelming this week, just consider how little our voices actually get heard. If just ONE person who didn’t know what a CHD is learns about it, it could potentially end up saving a life. And I think that’s worth it, don’t you? Dustin and I openly share Liam's story with others. We feel people who ask (or even some that don't!) probably want to know. And not in a scary way, but we just mention what a CHD is and how common it is. So many moms I know say they know someone who has a child with some type of heart issue, even if they don't know exactly what to call it. ADVOCACY is becoming even more important, as our health care system fringes on huge changes and massive overhauls. Another startling fact? Funding for CHD's is grossly underfunded. In order to fund medical technology, we need government support and funds. Think of how the 2.2 billion a year could be minimized (and needless to say here how many more lives could be spared) if less invasive surgical procedures could be brought about? It's ALL about funding. And it's all about backing. And from the responses I have received from some of our government representatives, it is clear more educating and AWARENESS needs to be done on CHD's. It works hand in hand. I have several national organizations links below, who are working hard on AWARENESS and ADVOCACY for CHD's. Join them, "Like" them on Facebook or spend a minute or two to get educated on ways you can help. 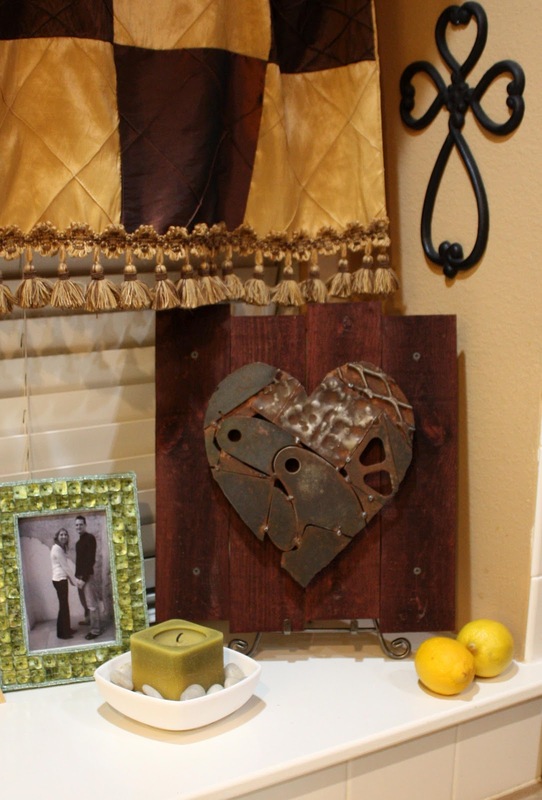 This special “heart art” was made in honor of my son, Liam. It honors all the “heart hero” children and adults who battle each day with life-threatening Congenital Heart Defects. The special symbolism in the pieced-together metal heart mirrors their strength and courage. 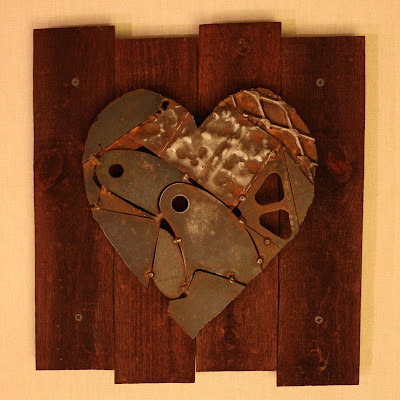 The metal heart is bolted onto a 12” x 12” board (3/4" deep) covered in recycled wood planks and the heart is raised 3/4” off the board. The metal heart was soldered using scrap metal and then sealed using a clear satin enamel sealant. Finished size is approximately 13" x 13". All you have to do to enter is leave a comment on THIS POST (with at least your first name and last initial). Tell me what is the most important thing you have learned either as a heart mom or as a follower of our journeys. Get another entry by liking my Simple Blessings Design Facebook Page and leaving a comment there. And one more entry for linking to this post in your own blog, just leave a link to your blog post in a separate comment here on this post. Contest will end at midnight on Monday, 2/13/12 and the winner will be announced on Valentine's Day. So, spread the word and let's help spread awareness for CHD's!! Tara, the heart is beautiful!!!! Through Mason's heart journey, I have learned that God and His miracles really do exist and happen to "common" people! WOW! Do great minds think alike, or what? :) You are incredibly talented, Tara! One of the most important things I've learned (still learning) is to really cherish each day I have with Ethan. I know that sounds cliche, but it's true! YAY for giveaway, awareness fun! One of the most important things that I have learned is humility. It has taught me that it is ok to accept the help of others. It has opened my eyes to a completely different world out there. I also linked your giveaway to my Interview with a Heart Mom post today. I am excited to read the rest of your posts for CHD Awareness Week. Love what you are doing! Great post Tara! One of the things I have learned through this journey is that you have to be an advocate and the voice for your child in all this. These little ones are fighting for their lives and we, as parents, must do all that we can to help with this fight. Your heart work is beautiful. The meaning behind it brings tears to my eye (yes I get emotional during heart week)! Tara, your art is beautiful! I have learned a lot so it's hard to choose the most important thing...I guess I will say learning to live in the present. I'm a much better mother than I would have been if things had been easier for us. Living in the present also means I'm getting better at taking care of myself too! I have learned to truly appreciate each and every moment with our little heart miracle. I know so many people say that- but I fall asleep each night truly thanking God for each and every minute I get to know and love our sweet boy. I learned to be a little more patient with my kids...because they are still here with me. And I am thankful that she is here with me!! I just liked your FB page. As a follower of your journey I have seen a true testimony of faith. The beauty of true faith is that it inspires confidence and gives hope. May God bless you and all families who promote CHD awareness this week. You are making a difference in a childs future. My heart beats for you Liam. I've learned that Liam is a tough little kid who has two incredibly Godly, strong parents. Being a heart mom has solidified that GOD is the ONLY way! (Sorry about the 'reply' above. The comment box wouldn't show up and...I don't know. Ha! I'm not a heart mom, but as a heart dad, I've learned to appreciate each and every moment I have with Tucker because each one is a blessing from God. I've also learned that God gave us Tucker and his special heart so that we can bless others and so that we can build friendships with great people like you guys! Here is our post with a link back to you guys, thanks for all that you do! As I'm making my last minute blog posts for CHD Week (thanks again for contribution on Maxon's blog), I am putting in my last minute entries for your wonderful "heart work". I've liked and shared on Facebook. And, I've linked to your blog in my second post for today. 2.29.12 - Swallow study = Progress! 2.17.02 - Praise the Lord!